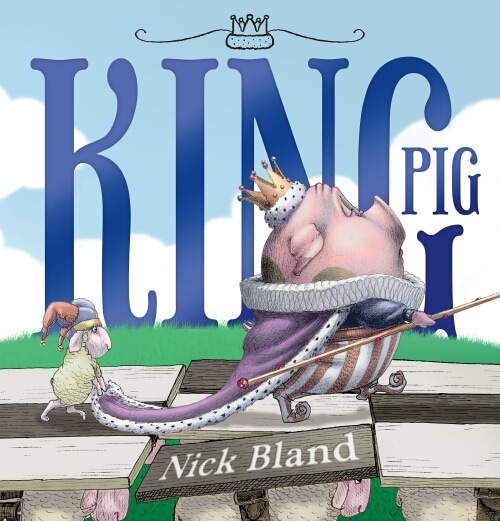 King Pig was written and illustrated by Nick Bland, and published by Scholastic Press (2013). Australian RRP: $24.99. Because he was the king, he could make the sheep do whatever he wanted, whenever he pleased. But he just couldn't make them like him. A royal romp about a little pig with a lot to learn, from best-selling picture book creator Nick Bland. Nick Bland is brilliant at subtext. At the story's start, the text tells us the King can't understand why his minions, the sheep, don't adore him, but complain all the time. The illustrations show us very clearly the King's arrogance as he strides along on the backs of subservient but fed-up sheep. The King also assumes the sheep to be teasing him when they smile toward him. Great fodder for discussion just in the first two pages! As the story progresses, we continue to see how misguided the King is, and we begin to despair that he will ever work out how to be friends with the sheep. Kids will love Bland's illustrations. He is a master at deftly portraying emotion and character. Each page has lots of detail for kids to guffaw over, discuss and ponder on. My favourite is the King decked out in his spectacular new costume - oh so proud of himself, and oh so foolish. Perhaps kids will remember another Dignitary who thought he looked pretty spiffy in his brand new clothes? 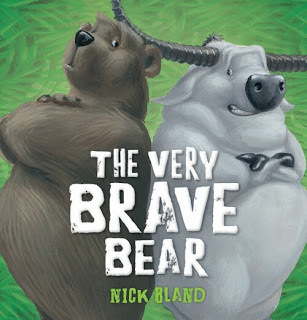 The Very Brave Bear was written and illustrated by Nick Bland, and published by Scholastic Press (2013). Australian RRP: $16.99. The Very Cranky Bear is back, and this time he's facing Boris Buffalo in a battle of bravery! But will something surprising send them both fleeing through the forest? Vibrant illustrations and a fun, engaging story make the book perfect for reading aloud. This is the fourth book about the delightful and endearing Very Cranky Bear. Here's the hero kids will remember from The Very Cranky Bear, this time playing 'who's the greatest?' with Boris Buffalo. I love that the book has rhyming text, with page turns allowing kids to predict the end rhyme. It's a fun story for kids but parents and teachers will have a chuckle over the boasting too. Boris and Bear are very like kids in the playground daring each other to feats of strength! Again Bland's illustrations are superb, with such attitude and bravado in each character appearance! My review copy is a lovely sturdy and colourful hardback edition, perfect for a book that's definitely destined for repeat readings. You may also like to read my learning activities based on Bland's The Wrong Book. Also: it reminds me of Chris Van Dusen books..
Resh, he is so very pompous, isn't he? I do hope you can find Bland's books. I think your daughter will enjoy them.